Ephemeris for Tuesday, April 23rd. Today the Sun will be up for 13 hours and 52 minutes, setting at 8:37, and it will rise tomorrow at 6:43. The Moon, 3 days before last quarter, will rise at 1:24 tomorrow morning. High in the southeast at 10 p.m. is a tiny and faint constellation of Coma Berenices, or Berenice’s hair. In it are lots of faint stars arrayed to look like several strands of hair. The whole group will fit in the field of a pair of binoculars, which will also show many more stars. 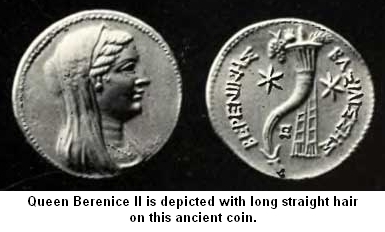 The hank of hair was supposed to belong to Berenice, a real Queen of Egypt, of the 3rd century BCE. who cut off her golden tresses and offered them to the gods for the safe return of her husband from war. Her husband did return safe, and at that same time her hair disappeared from the temple. The oracle of the temple pointed to this constellation showing that her sacrifice was enshrined in the stars. 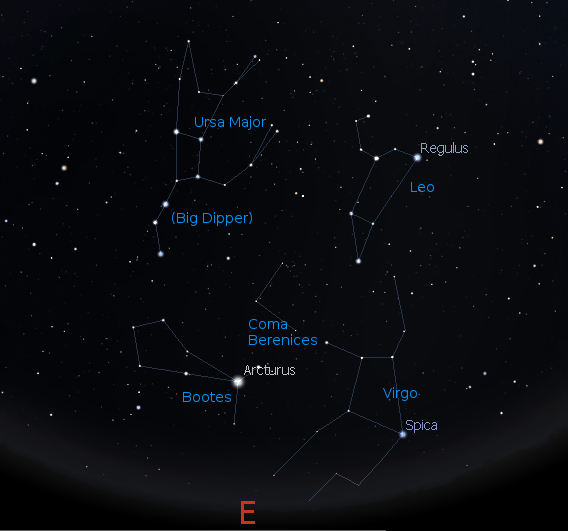 Coma Berenices and neighboring constellations at 10 p.m. on April 16, 2015. Note that only the upper right star of the upside down L shape actually belongs to the cluster. Created using Stellarium. Ephemeris for Thursday, April 4th. Today the Sun will be up for 12 hours and 55 minutes, setting at 8:13, and it will rise tomorrow at 7:16. The Moon, 1 day before new, will rise at 7:51 tomorrow morning. Midway up the sky in the east-southeast at 10 p.m. is a tiny sprinkle of faint stars arrayed to look like several strands of hair. It’s the constellation of Coma Berenices, or Berenice’s hair. The whole group will fit in the field of a pair of binoculars, which is the best way to see it, and will also show more stars. The cluster contains about 50 stars and lies at a distance of 280 light years from us, which makes it the second closest star cluster. The closest being the Hyades, that is the face of Taurus the bull now about to set in the west. The star cluster appears to be about 480 million years old. It is an open or galactic star cluster, born along the plane of the Milky Way. It appears away from the milky band due to its closeness to us. Coma Berenices finder chart 10 p.m., April 4th. Created using Stellarium. 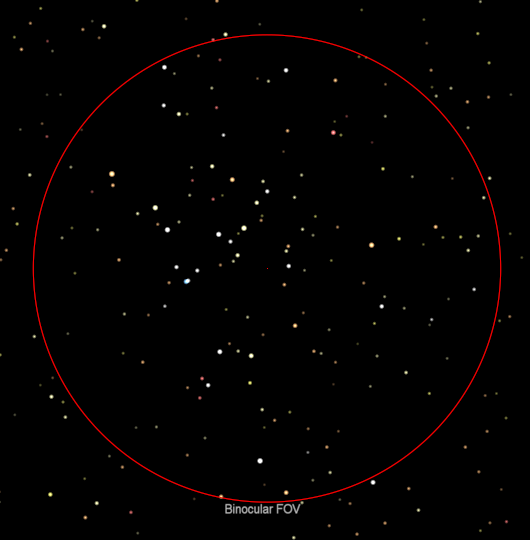 Approximate 7 power binocular field of view of the Coma Berenices Cluster. Created using Cartes du Ciel (Sky Charts). Ephemeris for Tuesday, April 2nd. Today the Sun will be up for 12 hours and 49 minutes, setting at 8:11, and it will rise tomorrow at 7:20. The Moon, 3 days before new, will rise at 7:03 tomorrow morning. In the south and southeastern sky at 10 p.m. can be found the constellation of Hydra the water snake. Unlike the monster of the same name this Hydra has but one head, which is its most distinctive part. At 10 p.m. look to the south. The head of Hydra is located below a line from the constellation Leo the Lion in the south and Gemini high in the west-southwest, and directly below Cancer the crab. Hydra’s head is a small but distinctive group of 6 stars that make a drooping loop to the right. The rest of Hydra wends its way diagonally to the southeastern horizon below the bright blue star Spica in Virgo. Some delineations of Hydra have the tail tickling the constellation Libra which is just about to rise at that time. Hydra the water snake finder animation for 10 p.m. April 2nd.. Hydra is the longest of all the constellations. Click on the image to enlarge. Created using Stellarium and GIMP. Ephemeris for Friday, March 22nd. Today the Sun will be up for 12 hours and 14 minutes, setting at 7:57, and it will rise tomorrow at 7:40. The Moon, 2 days past full, will rise at 10:07 this evening. The Anishinabe peoples of the Great Lakes Region, which includes the Ottawa, Chippewa and Ojibwe Indians have one constellation of winter I know of. It is The Winter Maker which uses many of Orion’s stars and whose arms stretch from Aldebaran in Taurus the bull to Procyon the Little Dog Star, embracing the whole of the winter sky. Now that spring is here he is sinking into the west. The first constellation of spring is Curly Tail, or the Great Underwater Panther. Which uses the stars of Leo the lion’s backward question mark as its tail and the small knot of stars that are the head of Hydra the water snake below Cancer the crab as its head. Keep off the thinning ice or break through and be snatched by the great panther that lives below. Great Underwater Panther finder animation relating western to Anishinaabe constellations for 9 p.m. March 22, 2019. Click on the image to enlarge. Created using Stellarium. 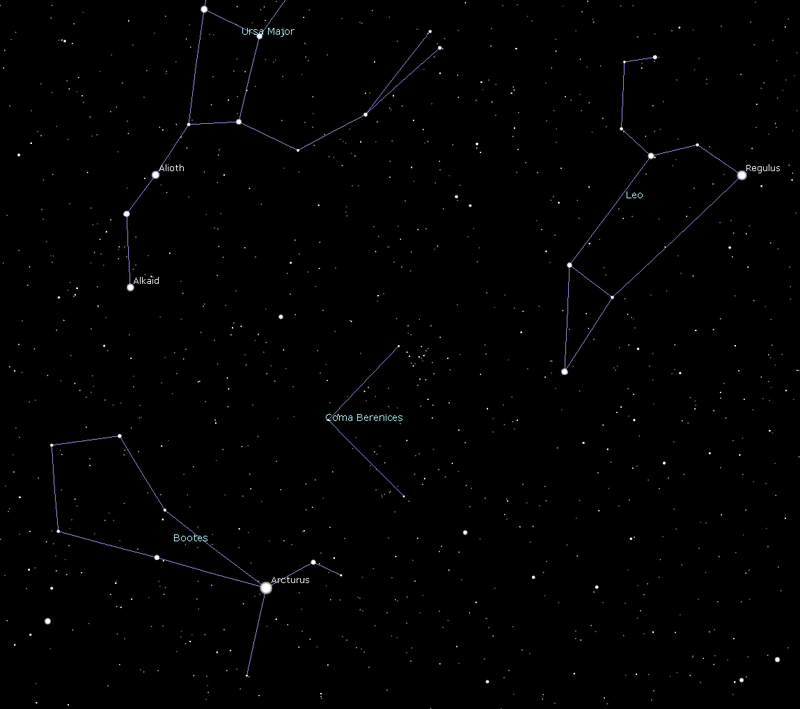 The constellation art is part of the latest versions of Stellarium. Ojibwe (Anishinaabe) constellation art by Annette S Lee and William Wilson from Ojibwe Sky Star Map Constellation Guide, by A. Lee, W Wilson, C Gawboy, J. Tibbetts. ISBN 978-0-615-98678-4. Ephemeris for Thursday, March 7th. Today the Sun will be up for 11 hours and 28 minutes, setting at 6:38, and it will rise tomorrow at 7:08. The Moon, 1 day past new, will set at 7:42 this evening. 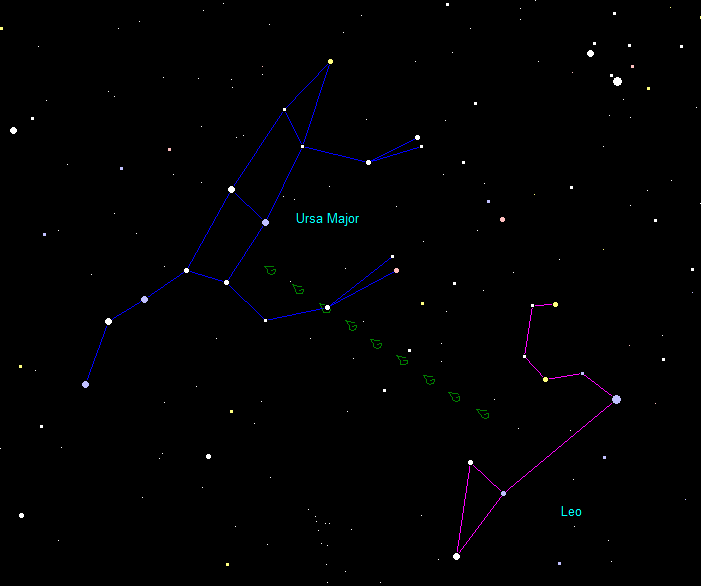 Tonight as twilight fades around 8 p.m. the constellation of Leo the lion can be seen rising in the east. The head and mane of a male lion is seen as a backward question mark. This pattern of stars is also called the sickle. The bright star that is the dot at the bottom is Regulus, the “Little King Star”. To the lower left is a triangle of stars that is the lion’s hind end with the star Denebola at the far end. It is said that the reason the figure of a lion came to be seen in the stars here is because lions came from the desert, driven by the heat, to drink from the river Nile the time of the year that the sun was in this part of the sky. Leo can also be found by first locating the Big Dipper high in the northeast, a hole in its bowl drips on Leo. The constellation Leo rising animation. Created using Stellarium and GIMP. Finding Leo from the Big Dipper: Leaky Big Dipper drips on Leo. Created using my LookingUp program. Ephemeris for Fat Tuesday, March 5th. Today the Sun will be up for 11 hours and 21 minutes, setting at 6:35, and it will rise tomorrow at 7:11. The Moon, 1 day before new, will rise at 7:33 tomorrow morning. While Orion and the stars of winter are still holding forth in the south the Big Dipper is sneaking up in the northeast. Indeed at 8 p.m. the front stars of the dipper’s bowl are half way up the sky, at the same altitude of Polaris the North Star. To the Anishinaabe native peoples of this region the Big Dipper wasn’t part of a bear, it was the hind end of the Fisher, Ojiig in their language. The Fisher, a magical animal of their legends, a weasel-like animal brought warm seasons to the Earth, and serves as a weather indicator. As he climbs the sky in the east he is signaling spring and the maple sugaring season. The Big Dipper is also a pointer to some of the important stars and constellations of spring. The Big Dipper, as Ojiig the Fisher of the Anishinaabe people rising higher in the northeast at 8 p.m. March 5, 2019. Created using Stellarium. The Anishinaabe constellation drawing of the Fisher is from Ojibwe Sky Star Map Constellation Guide by Annette S. Lee, William Wilson, Jeffrey Tibbets and Carl Gawboy available locally and online. They are part of the latest editions of Stellarium, a free planetarium program. Links to it are on the right. Other information and links are available within the Sky Lore tab. Ephemeris for Friday, March 1st. Today the Sun will be up for 11 hours and 9 minutes, setting at 6:30, and it will rise tomorrow at 7:18. The Moon, 3 days past last quarter, will rise at 5:23 tomorrow morning. I will be previewing the skies of Spring this evening at this evening’s meeting of the Grand Traverse Astronomical Society (GTAS) at 8 p.m. at Northwestern Michigan College’s Rogers Observatory. The spring stars seem to get away from us with the rapid advance of sunset and the big bump of daylight saving time on the tenth. After the meeting there will be a star party starting at 9 p.m. On tap if its clear will be Orion and its great nebula, a star nursery only 1400 light years away. It will be a wonderful sight with its clouds and wisps of gas and dust illuminated by a clutch of hot baby stars. The Observatory is located south of Traverse City on Birmley Road off either Garfield or Keystone roads. The constellations of spring with some constellations of winter leaving to the west and those of summer entering from the east. Click on the image to enlarge. 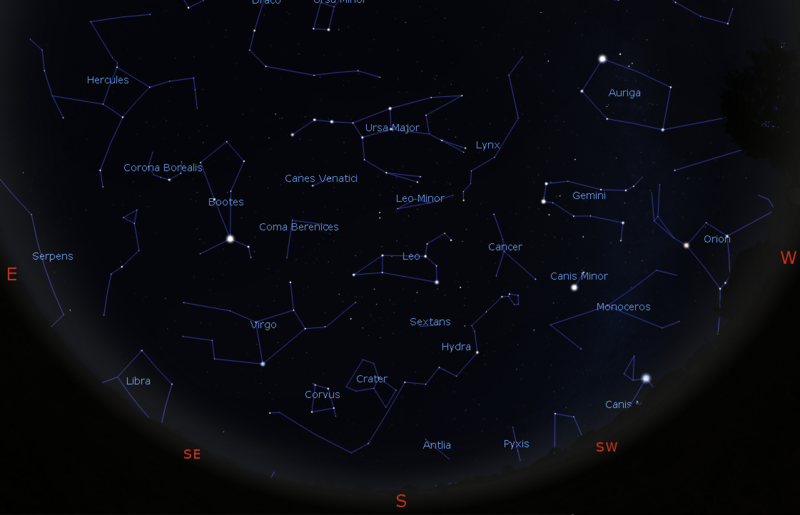 Created using Stellarium.